4 DAYS OF NON-STOP FUN! FREE! WHAT?! Yeah FREE ADMISSION & PARKING…Can’t get any more affordable! Cooking starts at 11:00 am, Judging 5:00 – 6:00 pm, and Awards at 6:00 pm on Main Stage. Elkhorn Ribfest on the Walworth County Fairgrounds: 411 East Court Street, Elkhorn, WI 53121. Want to be a part of the run? CLICK HERE for more details. 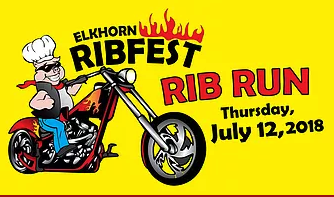 Elkhorn Ribfest Rib Run is new this year. A free to enter, open bike show where you ride and park right in the middle of the festival grounds. Arrive anytime before 6pm for judging. Trophies and prizes for some fun categories. Food discounts for all riders. Good food, good music and good times. FREE ADMISSION.